When you've consumed your volumetric weight in pho broth, you need a detox. I chose a back-to-basics bowl of bo kho, Vietnamese beef stew, a dish more likely to be cooked and eaten at home than in restaurants. This isn't to say it is simple or dumbed down by any means. A typical bo kho will contain chunks of beef, long-stewed to softness, potatoes and carrots, simmering in a dark, caramel-colored, crimson-red-by-annatto, tangy-by-tomato broth redolent of ginger, star anise, lemongrass, cinnamon, curry powder and a touch of Chinese five-spice. It ain't a can of Dinty Moore. 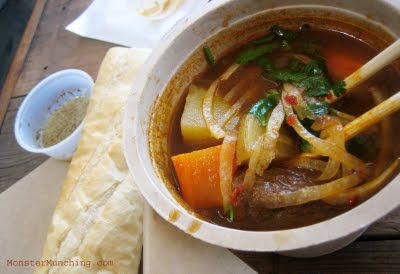 Since the liquid is thin, it's more apt to be sipped or sometimes combined with noodles--closer to a soup than a stew. 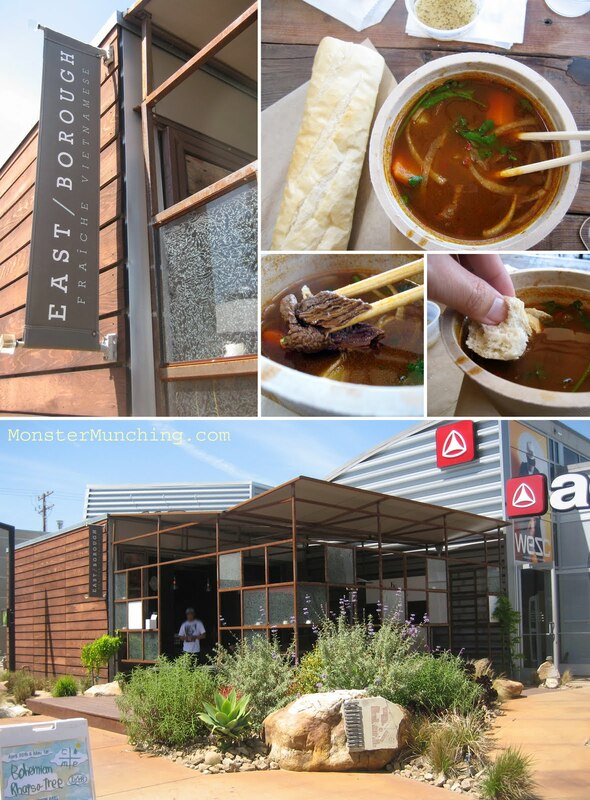 Outside made-by-mom renditions, bo kho can be found when you dig into Little Saigon menus. Le Croissant Dore does it ladled out on plates and eaten with torn scraps of crusty French bread. I'd go to Le Croissant Dore, but the travel time from the office would gobble up a good chunk of the lunch hour. East/Borough, on the other hand, is within minutes. That it is from the new school of Vietnamese eatery (think Nom Nom and others), should be obvious when you know it's at The Camp, a breeding ground for the outdoorsy, the unique and the hippie. East/Borough's owners are young entrepreneurs who grew up eating the foods cooked by mom, now out on their own with a fistful of family recipes. 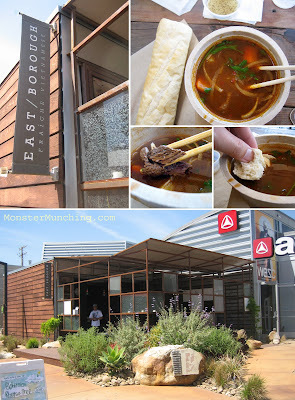 Like the Nom Noms, their specialty is banh mi, but since it is at The Camp and because they can, their stew is served in compostable bowls and eaten out in a patio area covered by tarp. The cashiers and servers are young things and everyone speaks perfect English; but the flavor of their bo kho seems as though they recruited grandma to cook in the back kitchen. I soaked my foot-long baguette piece by piece like donuts to coffee, dipped the boiled skin-on potatoes into a thimble of pepper-flecked lemon juice, slurped up the soup and enjoyed the dish just as if I ate it in Little Saigon or some Vietnamese friend's kitchen. To the right of me sat two Asian twenty-somethings chatting about wedding showers, birthday parties, and idle office gossip as they ate spring rolls. Curious at what I was served, they stopped their chit chat and asked me what I was having. "Oh, this is beef stew." "It looks great!" one of them said, "I should try that next time." Papaya Thai Bistro operates not unlike the Pei Wei's of the world. Order almost any dish and you have the option of the protein you want to put in it, whether it moos, clucks, oinks, or...whatever the sound a shrimp makes. The interchangeable meat is like a character you create for a role playing video game. Both the game and the overall dish remain the same, but who the protagonist will be is up to you. The vegetables and seasonings are the NPCs (that's non-player characters for you non-gamers). These are the constants that its creators include to propel the story. And it's the vegetables that Papaya respects most. Whether sliced, julienned, or chopped, anything that once came out of the ground tastes as though it just did. Carrots snap, verdant Chinese broccoli bites firm and crisp, and everything plant-based appear on your plate just barely cooked, as it should be. This is Thai for the person who isn't afraid of chewing their veggies. Some dishes are better than others. Some actually use a bit too many veggies for my taste. But the green curry is the best thing I've had in a long time. As far as I'm concerned, Papaya Thai's only purpose is to cook this dish. 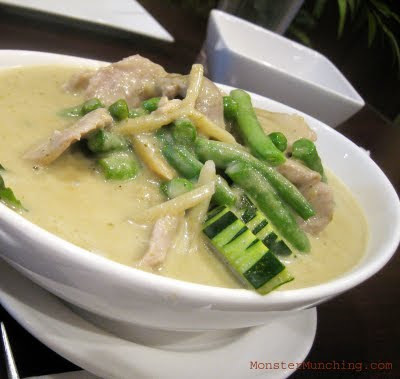 Here the matchstick thin bamboo shoots, green beans, cucumbers and peas join forces to occupy a bowl of liquid comfort. The veggies are welcomed as liberators by a gravy that hugs everything together and makes your meal. From its coconut-milk thick and creamy depths wafts up scents of kaffir lime, galangal, coriander and cumin. You need rice, plenty of it, to sop it all up. Every time I order this dish for take out, I plan ahead to be sure I have the rice cooked and ready at home. I require mounds and mounds of it on which to spoon over with curry, and to soak up every drop. Slightly sweet, slightly spicy, but altogether magical, it's one of those toe-curling meals you want for a cold, rainy night. When you're asked for the meat to include, don't get anything but the pork. Their slices of pig are so silky and tender it's obscene. Coated lightly in cornstarch (I think), each pinkish piece melts with barely a chew. Inherently, I like the idea of food trucks. Of eating outside. Of the impermanence of it all. There's something romantic here, something that answers the basic hunting and gathering instincts of the human animal. But more than that, I like how much easier it is to get to know the individuals making your food. These loncheras, whether newfangled or old-school, have passionate, dedicated, and proud people behind them. Find me a food truck entrepreneur who isn't easy to talk to and I'll show you a failed one. Chomp Chomp is no exception. They offered me an extra basket of taro and lotus root chips eventhough they didn't have to. Building customer relationships, perhaps more important than the food, are core driving (pun intended) principles. 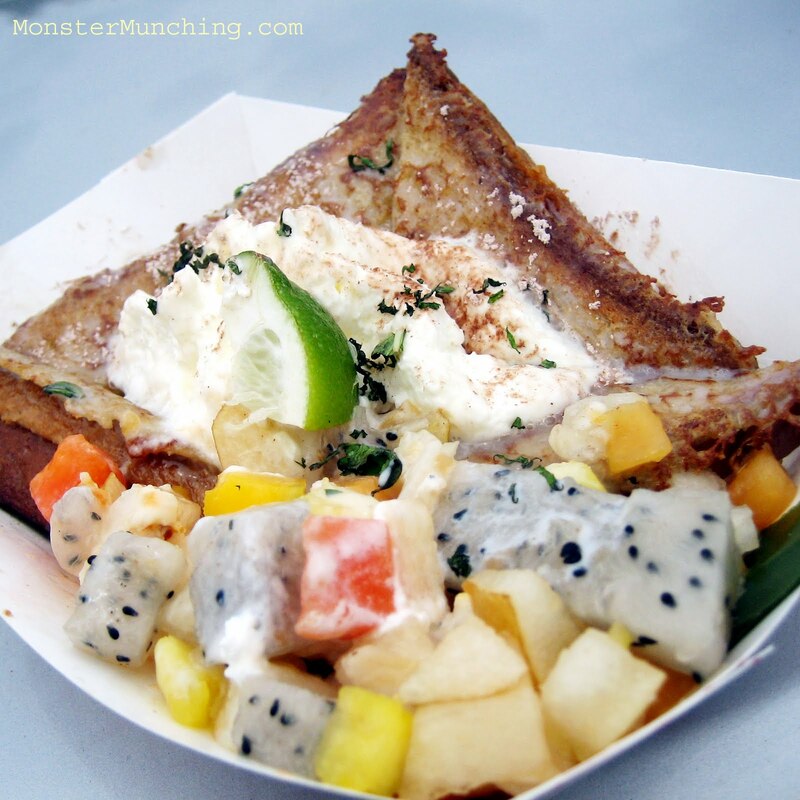 For me, however, Chomp Chomp is different from the rest because it represents the flavors that I grew up eating. These are the tastes that formed my food sensibilities and obsessions. As a kid, I ate rendang and sate with peanut sauce. As an adult, I made the pilgrimage to Singapore, the Mecca of food in my world, to eat at hawker stalls. But as I said before on my last food truck review, I got tired of the Twitter tracking, the driving, the chore of the chase. 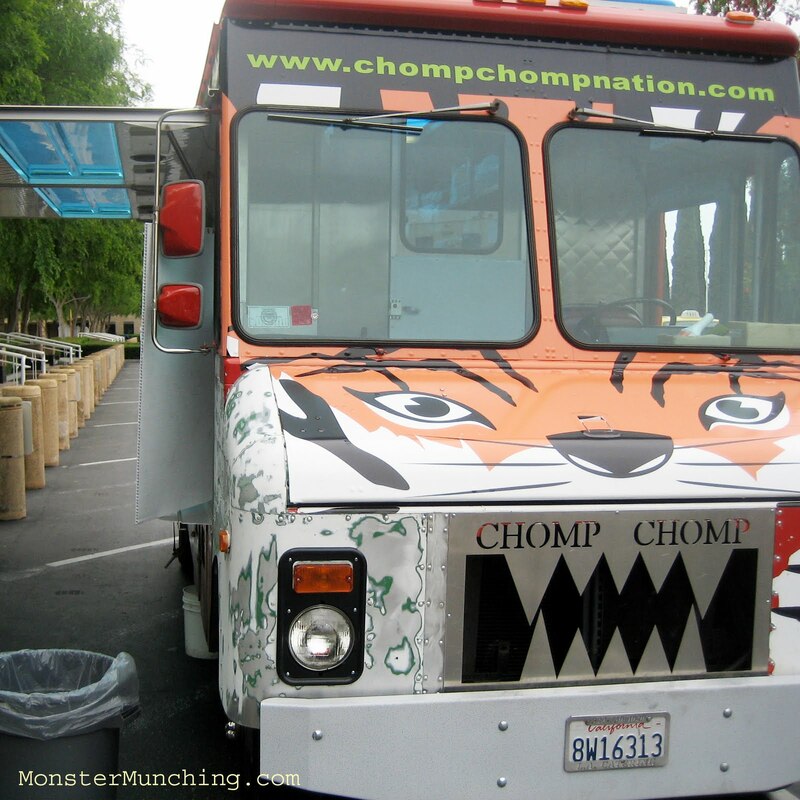 I didn't seek out Chomp Chomp so much as I ran into it at Irvine City Hall's parking lot, where one food truck is invited to sell daily near Bill Barber Park. If Chomp Chomp were a brick and mortar, I would've tried them sooner. I would've discovered early on that their sate's peanut sauce (sambal kacang) is pretty damned spot on, with all the depth of homemade. More importantly, that it comes with virgin white cubes of lontong, compressed steamed rice cake traditionally with sate. 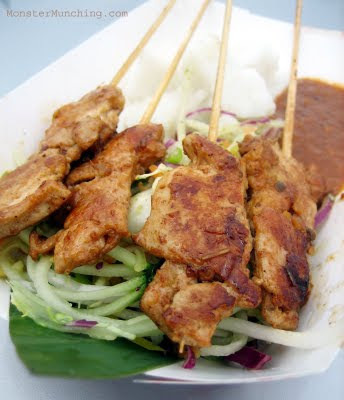 Though the chicken sate ($5), grilled chicken skewers, could've been bigger, longer, and firmer (that's what she sa...no, not the time), and also more charred, the spirit of the original dish is there. And so is the flavor, with shades of cumin and turmeric in the marinade. While I appreciate the reverence and retraint in their sates, I like the creativity and a playfulness in other dishes. Singaporean food culture, a delicious mish mash of Malay, Chinese, Indian among others, is more apt to reinterpretation than most. 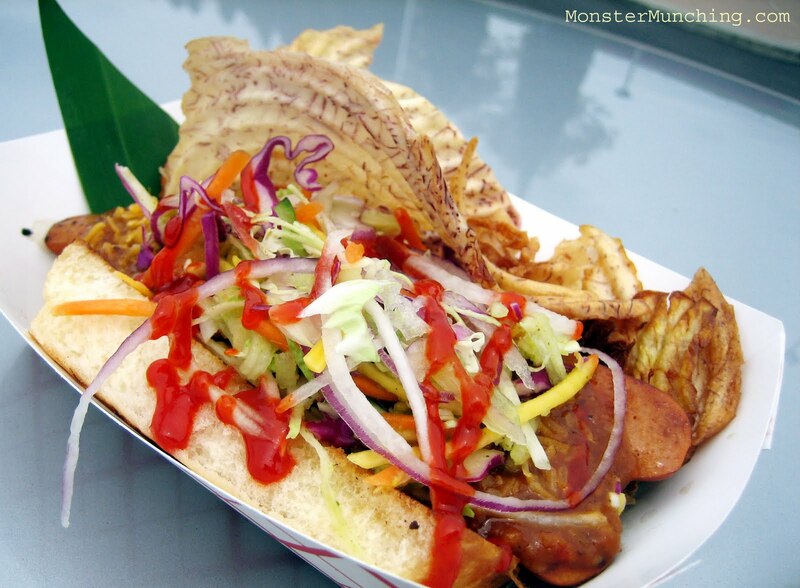 Their hot dog ($4)--a surprisingly potent and spicy hot link splayed down the middle and laid down on sweet, Hawaiian-bread-like bun--has a sweet, sticky, and flourescent chili sauce drizzled in zig zags and a base layer of more peanut sambal. The slaw they applied did little to add to the flavor barrage and became just unnecessary roughage. My favorite dish, however, turned out to be something I am pretty sure is an original, not really Singaporean or Indonesian as it is just playing off the familiar flavors of the region. Here is a dish that knows that coconut milk, sweetened condensed milk, and fruit is used in a lot of South East Asian desserts and repurposes them on something distinctly un-Asian: French toast ($5). I liked how the coconut flavored frothy whipped cream dollops the top of a butter-soaked and eggy griddled bread and tastes more naturally fit for the task than maple syrup. And I like how, even as the toast already works by itself, the medley of cubed star fruit, lychee, mango, jackfruit, pears and papaya brings it home...in both senses of the word. If I only had one request for Chomp Chomp, it's for a lot more Singaporean hawker standards. I hope, for instance, they consider taking on laksa, noodles swimming in that distinctive coconut-milk rich, curry hell broth. The danger of a sloshing boiling liquid in a moving vehicle notwithstanding. Persian rice is something of a miracle. Light and fluffy as if it were made of cotton ball clouds, it is also just slightly tangy, a streak of yellow on top of the basmati mound as bright as mottled sunshine. Hen House Grill does it well and as it should be. Oh, did I mention the quantity? If there's one other constant with Persian rice at restaurants, it's always doled out in ridiculous portions. A typical serving is always more than enough to feed two. And in Hen House Grill's special chicken koobideh lunch, $7.99 not only gets you the starring starch, but a freshly-baked flatbread the size of a small pizza, two meaty tubes of one of the best char-flecked koobideh's around, two grilled tomatoes, and a drink. We shared a plate, shoveling the rice, smooshing the tomatoes into an impromptu rice-moistening sauce, shaking flurries of sumac and squeezing lemon juice over our meal. 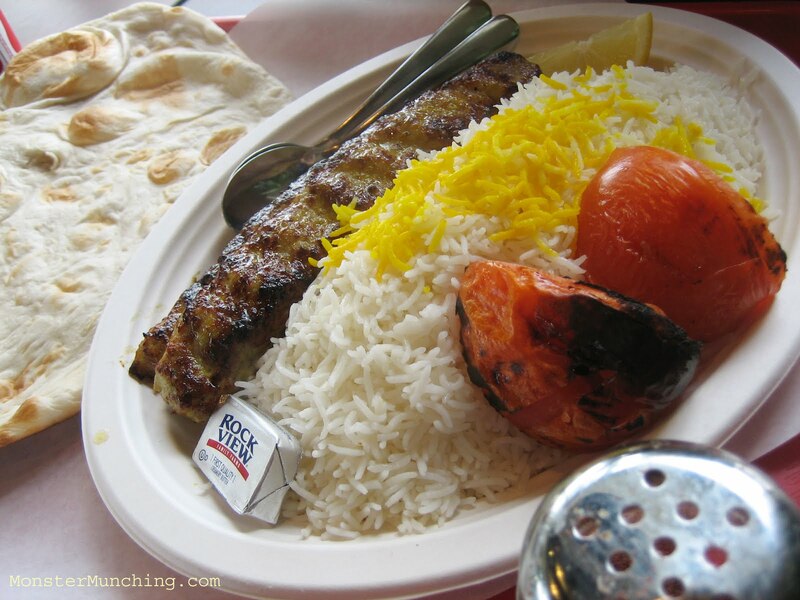 The koobideh, ground and seasoned chicken cooked over flames on a metal sword and unsheathed, simply melts, and in my opinion, trumps the version made at the Wholesome Choice food court next door. And oh yeah, so does Hen House's rice.